1. Every once in a while, we find some relic of days gone by on our place. Paul found this one hiking on a steep section of our land. Feel free to toss out ideas about it's original use. It is all metal, and about 7 inches long, maybe 3 inches wide at the largest part. 2. I told the boys about a historical fiction book I was reading about yellow fever. I forgot about it. A few weeks later they were doing worksheets I'd left for them while my mom watched them so I could work (Spring Break). One of the worksheets the twins did asked them to write about something that made them mad. Reid wrote that yellow fever made him mad, which no doubt surprised my mom. 3. I think I got our rabbits to breed. Rabbit gestation is 31 days. Rabbits don't waste any time. 4. It's much more difficult for me to sleep in the spring and summer. Does anyone else notice this? Does more light = less sleep? 5. I recently had a negative experience with a company, when they shipped something that wasn't adequately described online and as a result I could not use it. They wouldn't pay return shipping, even though the error was a result of their poor description. I'd been buying from the company since 2007. I am not the sort to rat out a company online, but I can say I will never make a purchase from them again. And I'm now out $14 in shipping fees. Readers, you had any irritating company experiences lately? Linked today with Willy Nilly Friday. Sorry about your bad experience. We had used the same company for about 10 years to buy mail order plants. Suddenly the quality was poor and their guarantee was no longer good. After some investigating, we realized the co. had bankrupted and was bought out but still used the same name. Like you, we lost money and time. I hope one of your readers will recognize the relic you found. I hope all of you have a very nice weekend. Hum, some kinda horse-hitch for a team of horses? Since my running has hit an hour I've been sleeping the best I have in years. My son's $8,000 insulin pump developed a crack in the same spot as the previous one. It's obviously a defect but its out of warranty and they won't acknowledge its a defect. We are changing to a different company. Looks like a hook that hung from a beam maybe.Could be to hold meat for a smokehouse. If I had to guess I would say that artifact is the remains of a fence post anchor of some kind or a fitting off some horse drawn pulling tackle. 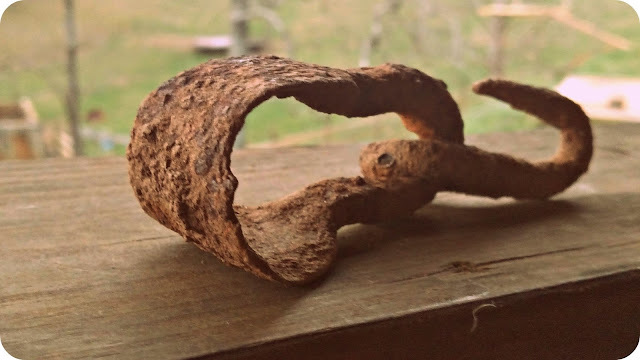 I have found similar looking items around here and once I found one that looks almost identical that still had the remains of a wood post or something inside the round part. how neat to find old things around your property...not a clue what it is but there are some pretty good guesses on here! i can't think of any bad shopping experiences lately but that is really messed up that they won't pay for your shipping! thanks so much for linking lisa and have a great weekend! the weather looks like it will be really nice!! I have the worst luck ordering someone online. I know it's probably just me but something always goes wrong yet my son in law ordered all the time and never has any problem. Reckon it's my age? Interesting relic... Makes one wonder who lived on that property YEARS ago.... Neat!!! Reid is a smart one - how many kids his age would have remembered that. Wow! Don't have a clue about the artifact. It is a single-tree hitch. The rounded part is where the rounded piece of wood goes. the piece of wood would have a hook or iron loop on each end. The hook goes in a iron loop on the end of a wagon tongue. When the team of horses pull, each horse pulls on this piece of wood that pulls the wagon. #1 Easy it's Captain Hooks hand. #2 Kids sure pick up on things. #4 It doesn't matter, I'm in bed at 9pm and up by 5am. #5 Never buy on line! Sorry about your order experience -- I'd rat them out so that it doesn't happen to others! Fun to find interesting things. Happy Friday! Yellow fever. That's a cute story. I've got one of those out in the barn. I think what Abraham said is correct- used for hitching mules to a wagon...I have an old photo that I think shows it in use. I'm like Betsy- I do shop online, but mostly at Amazon. Every now and then I run into problems..but not too bad. Those shipping fees are ridiculous! I have seen this hooks in use when I was very young. Have a beautiful weekend! You "got" your rabbits to breed? I thought they did it all the time! Maybe they don't deserve the reputation? Children absorb so much of what we tell them, even when they look like they don't care or aren't paying attention! I always loved all the history our daughter (and now grandson) absorbed just from listening to us discussing TV shows seen, books read and things we find interesting! They both love history now too. And yes, I have had a couple of mail-order run-ins. Not pleasant! Well, for one thing the birds are quite noisy this time of year.. so it kinda makes for less sleep. My husband had ordered a bunch of wax from a company for sculpture work. Their description was lacking. He got the wrong kind of wax. He wanted to return it, but they wouldn't pay for it / not even 1/2. I told him to use it to melt down for a different piece to pour into molds. That's what he's going to do. He didn't buy from them again. I sleep less, but I'm happier this time of year. Winter gives me the blues. What a cool relic! I love that you're teaching your kiddos about yellow fever, etc. They really do have the coolest mom. Maybe you could have told them you're an influential blogger and if they didn't pay shipping you would expose them on social media. I say that in jest, but companies seem to be a little fearful of bad press on social media.